20120212 -Up and all to church, D&J in Scout uniforms and looked good. 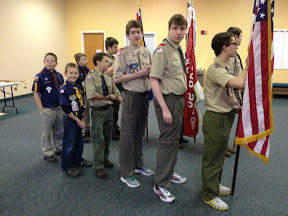 They had Scout day at church and they carried in flags, gathered prayer requests and the offering. D stayed for an extra service. LJG&I home. J&I go the last side on the tool table. D home and helped me clean up the garage. 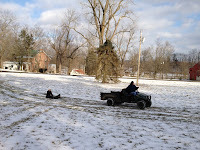 Then we all headed up to the farm. 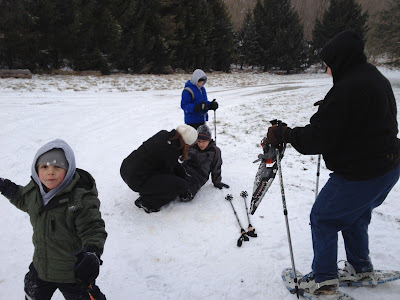 We went out side and the boys did some sled ridding, Pug pulling, rope swinging and snowshoe walking. We made a stop to see Aunt Weezer before dinner then on to BW3s. Home with 3 TIRED boys. Up late watching TV.